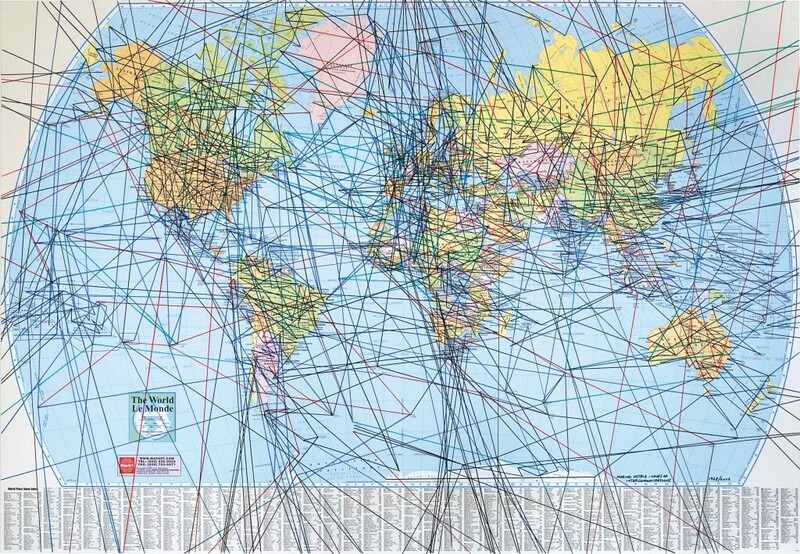 Bill Vazan, Intercommunication Lines, 1968/2002, ink on map, 82,2 x 113 cm. Courtesy of the artist. 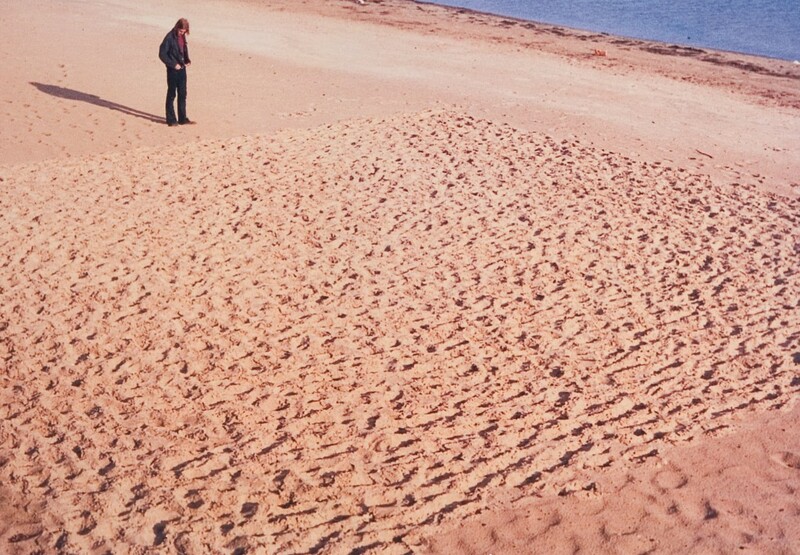 Bill Vazan, Summer Square in a Autumn Beach, Plattsburgh, N.Y., 1970, colour print, 14 x 22 cm. Courtesy of the artist. Bill Vazan, Lifeline, detail, 1970-1972, 1 000 postcards, varying dimensions. Courtesy of the artist. Bill Vazan, Yonge Street Walk, detail, Toronto, 1969/1972, 163 colour slides. Courtesy of the artist. 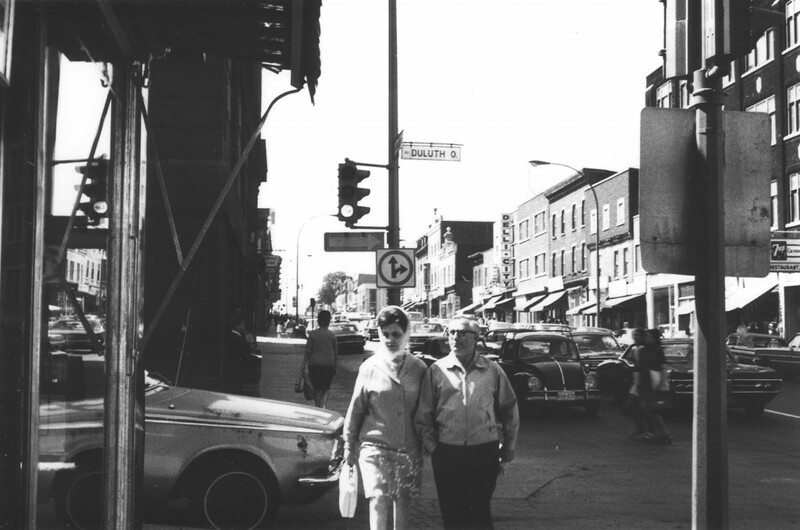 Bill Vazan, Walking into the Vanishing Point, Northward on St-Laurent, detail, Montreal, June 13, 1970, 60 silver gelatin prints, 10,2 x 15,2 cm each. Courtesy of the artist. View of the exhibition Bill Vazan, Walking into the Vanishing Point, VOX, from May 5 to June 23, 2007. 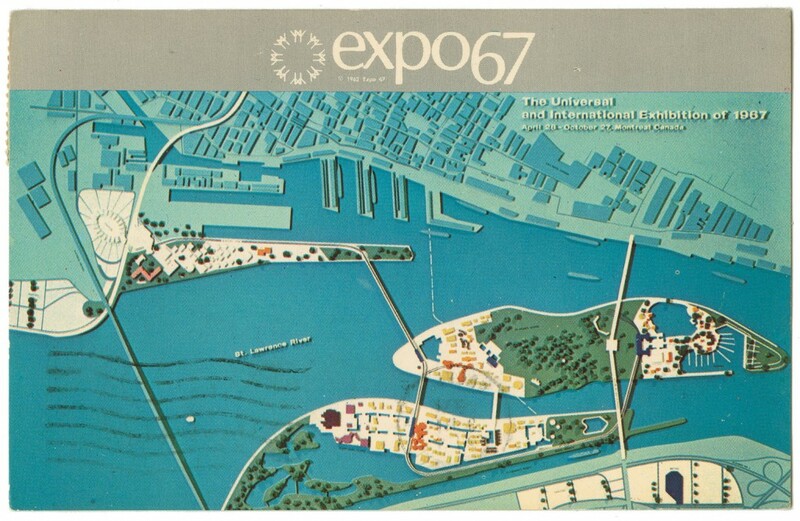 This exhibition has been produced with the cooperation of students in the art history department of Université du Québec à Montréal as part of an exercise designed to initiate them in the multiple aspects of exhibition design and organization. 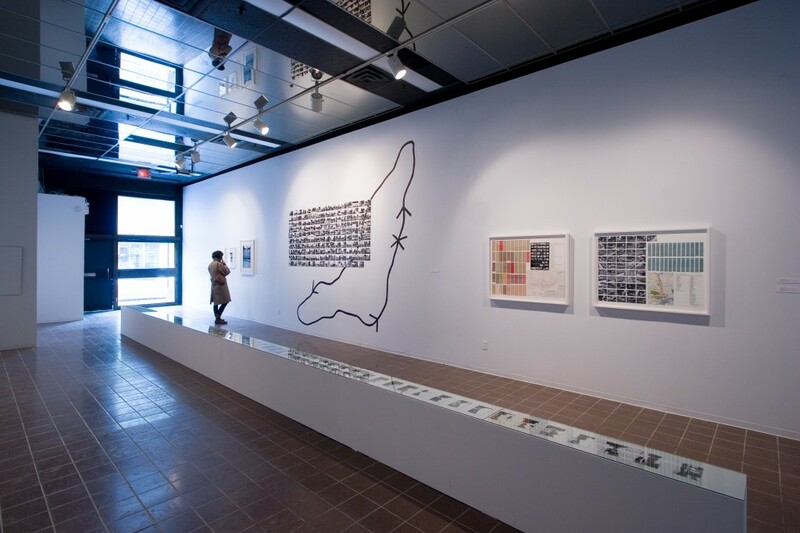 Curator assistance : Saada El-Akhrass, Catherine Héroux and Eugénie Marcil. Financing : Pascale Gagnon-Boucher and Élisa Mottard. 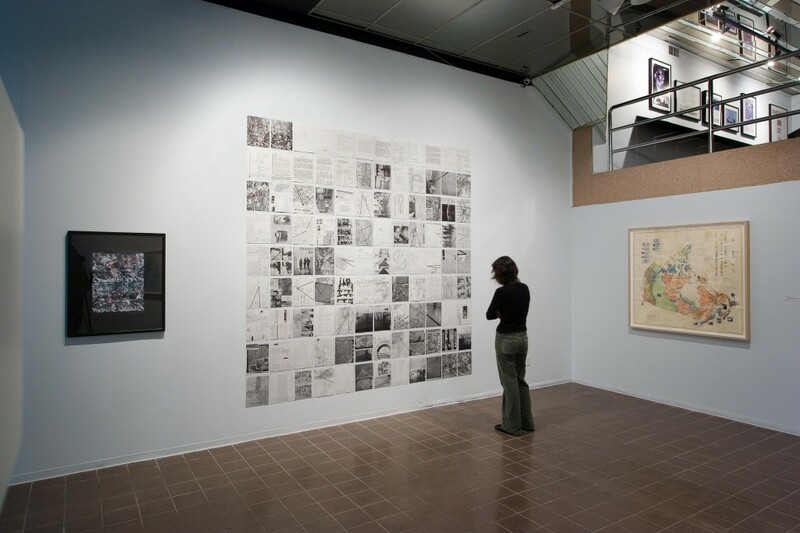 Research and documentation : Justine Lebeau and Geneviève Loiselle. Logistics : Daniel Gagnon. Journal coordination : Laurence Beaumier-Breton. 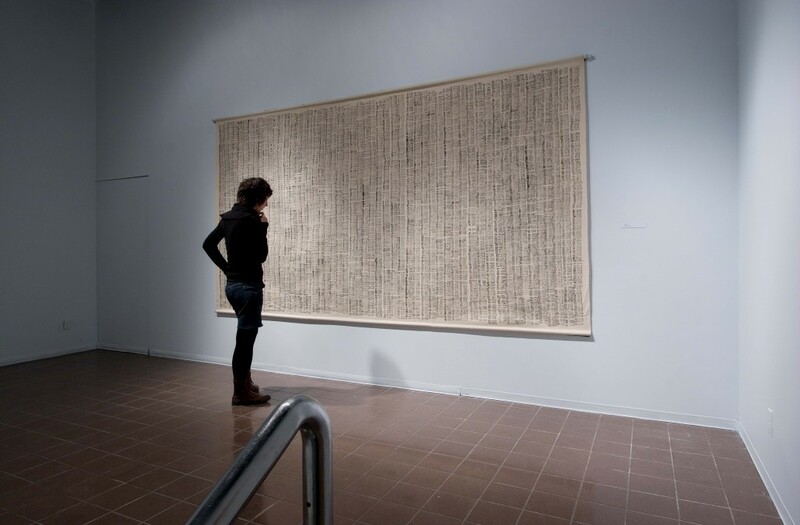 Exhibition circulation : Huguette Laperle. Promotion and press relations : Jacinthe Blanchard-Pilon and Marie-Josée Roch. Animation : Andréanne C.-Desfossés. Bill Vazan’s practice is usually associated with Land Art and multipart photographs, yet as early as the end of the 1960s he had begun developing a singular conceptual language and creating a series of emblematic works. Up to now these works have not received as much attention as his other art. In an effort to extend our research into conceptualism, begun with the presentation of the exhibition devoted to the N.E. Thing Co. and Iain Baxter&, we decided it was vital that we mount this first exhibition of Vazan’s conceptual art. 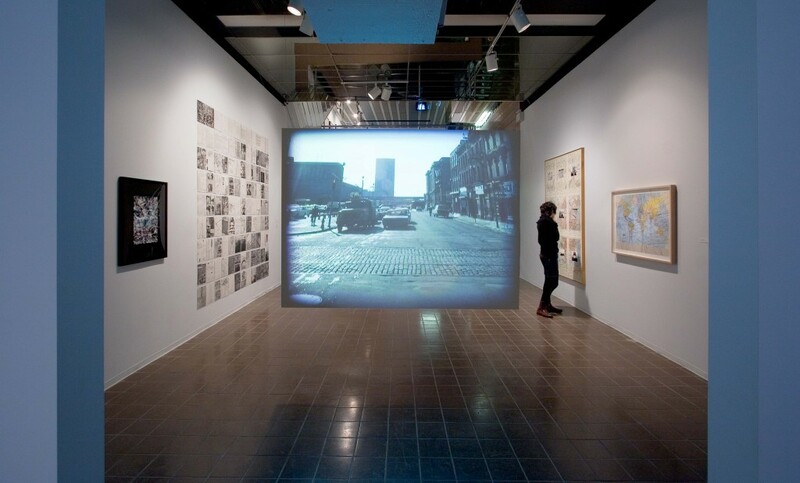 It brings together never-before-shown works, videographic experiments, and a major documentation component; it has been produced with the cooperation of students in the art history department of Université du Québec à Montréal as part of an exercise designed to initiate them in the multiple aspects of exhibition design and organization. 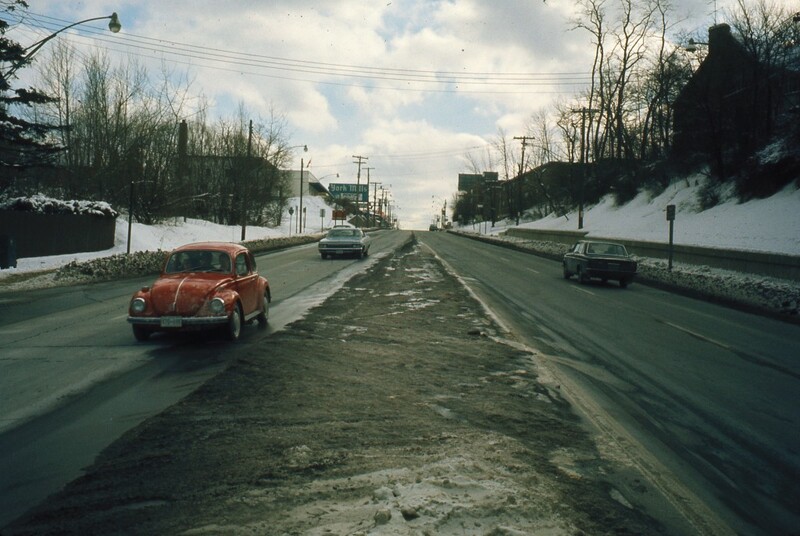 Since the late 1960s, Bill Vazan has made journeys on foot and by automobile, as well as along bus and subway lines, in Montréal and Toronto. 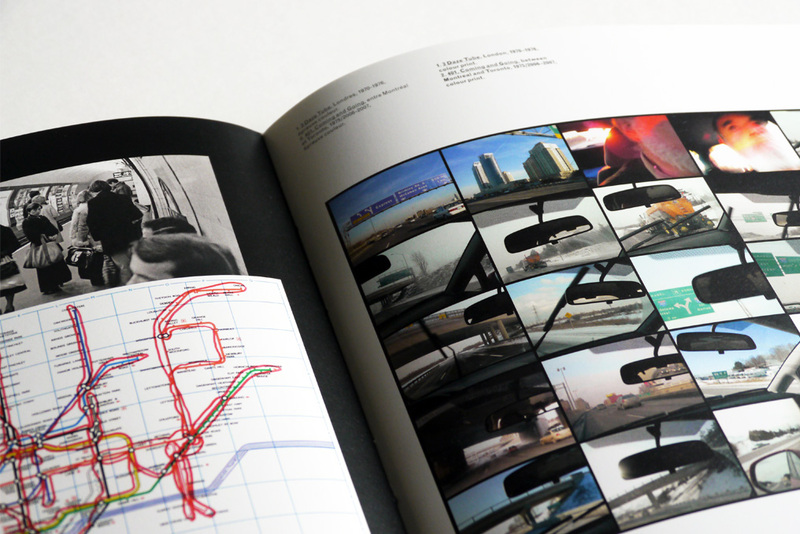 This performance-based enterprise has been deployed as sequences of photographs, sometimes comprising a hundred or so views; maps showing the routes followed; and annotations. The taking of the photographs always follows a systematic protocol (they are taken at every intersection, every bus stop, and so on), with the artist rigorously imitating the characteristics of amateur photography: approximate framing, unwanted reflections and interference, insouciance with regard to lighting. His method has the benefit of drawing attention to the action of the work and of rendering visible, or even palpable, the temporal and spatial constituents of the journeys accomplished. Contrary to his Land Art, which results in scrupulously thought-out and composed images, Vazan’s “itineraries” seek to capture a more immediate experience whereby the act of seeing and the act of recording take place simultaneously. By making walking (or travelling by other means) inseparable from the act of taking pictures, he is making a conceptual attempt to transform the distance between two points into the very material of the work. These local actions were created on a world scale when Vazan undertook the projects Canada Line (1969–1970), Worldline (1969–1971) and Intercommunication Lines (1968/2002), which represent an awareness of movements that have gone on to become global. 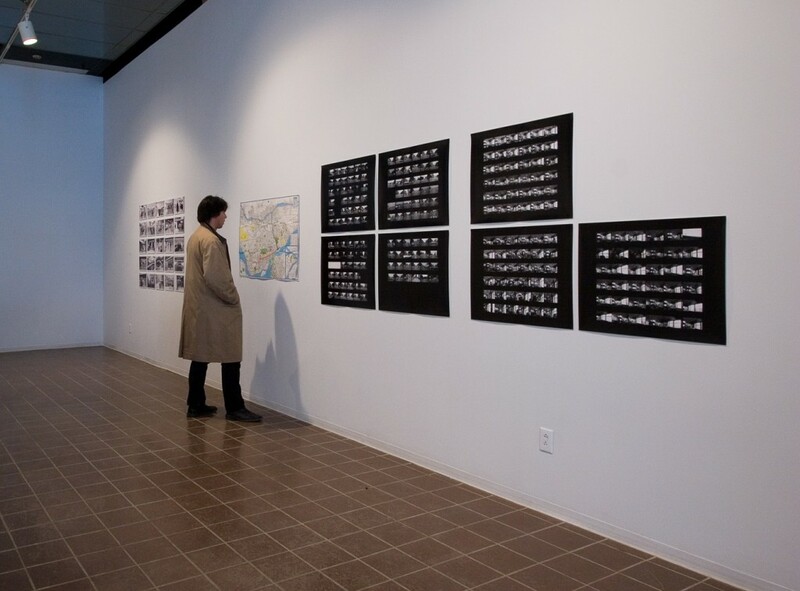 The artist marked lines in museums in eight Canadian cities, followed by eighteen others around the world, affixing lengths of black tape to the ground to virtually link all the locales. 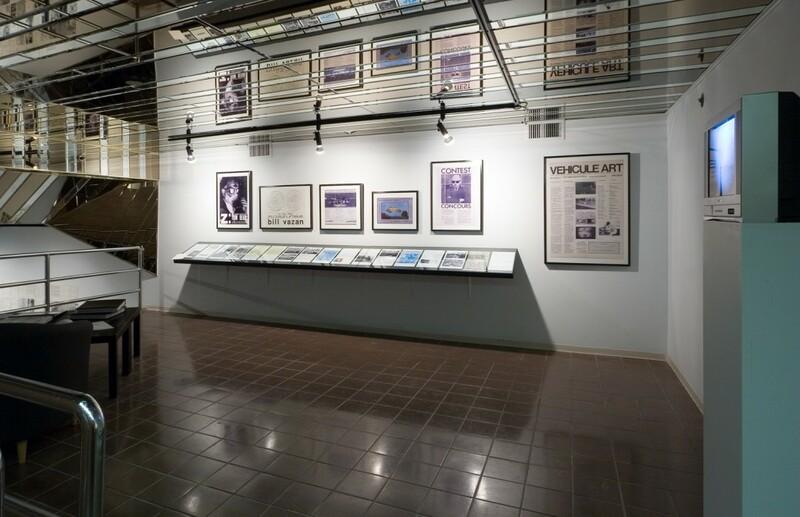 The Worldline project, implemented globally and simultaneously on March 5, 1971, also gave rise to a published work that documented every stage in the production of the project. Vazan’s virtual line is no less real than are borders between countries, air corridors, satellite communications or geodetic coordinates. It is the manifestation of a new form of space and time, which has become abstract in our society of global communication. Worldline and Intercommunication Lines give concrete expression to such lines – which, in configuring the space of the world, signal the end of distances and compress time, even as they generate major social, economic and individual movements. The issues raised in Vazan’s works remain current, and are elaborated through a conceptual language in which the line is predominant. That line is by turns ephemeral and imagined; it may be drawn in snow or in sand, even on postcards – although it is most often configured by journeys. 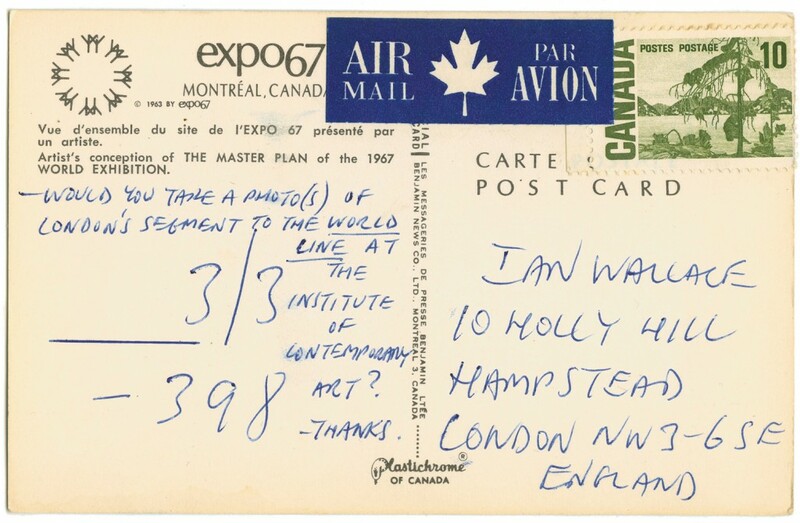 The line is the dominant element in Bill Vazan’s conceptual art in that it makes visible the links that exist between and among things, whether within a local territory or a system of worldwide communications. Walking. Moving. The point of departure and that of arrival. Each of Bill Vazan’s photographs affords the opportunity to stop and scrutinize one’s own way of moving and one’s own way of seeing. The artist’s photographic work is constructed around the individual’s awareness when casting his or her gaze upon the world – not with the desire of possessing it, but of marking it by his or her presence. Thus photography documents the artist’s gaze and travels, in addition to framing the urban environment and its transformations. Based on a rigid protocol, it captures a world that is changing – visible in the sequences of successive pictures – and is directed at us as a response to our own mobility. That succession of images, accentuated by the way in which the artist arranges the sequences spatially, forces us to consider time in a linear manner. One must insist on the documentary nature of Vazan’s photographs, which appear as a testimonial to his many travels – to his passage. 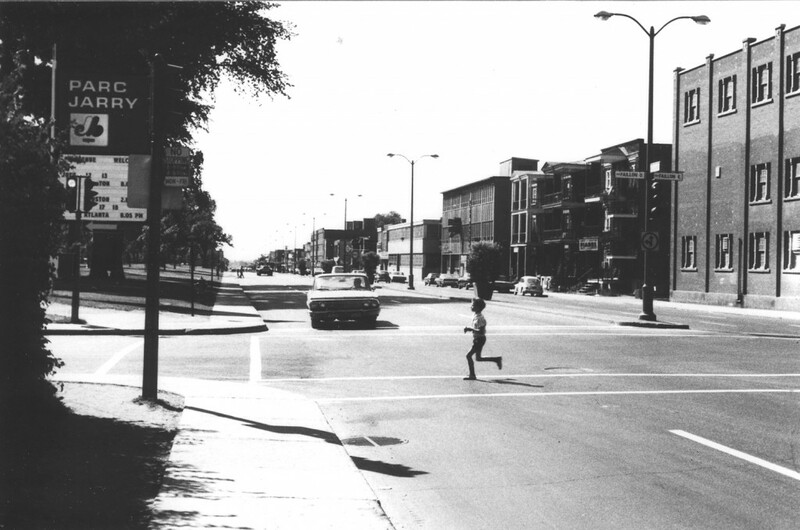 They become the memory of an action taken in urban space, even as they make manifest the duration of the movements. As documentation of a gaze and archiving of a passage, these photographs contain the memory of a transitory period of time. From one step to the next and from one space to a specific place, the awareness of belonging to physical reality is also present via the demonstation of a local territory deployed in the space of the world by means of works that make use of communications networks. This relationship to “in-betweeness” remains systematic in the artist’s practice, considering that every street corner, every intersection, every subway station – in short, every stop – is what makes up the major part of this conceptually based oeuvre. In a more general manner, Vazan fixes urban movement, delivering another conception of time: time that stops. A moment to breathe amidst the continuous vibrations of the networks of all kinds that direct the flow of reality: the city’s streets, its underground networks, and so on. Bill Vazan’s photographic work emerges mainly as a document that is at once intimate and historical, accounting for the gaze he casts on urban reality. 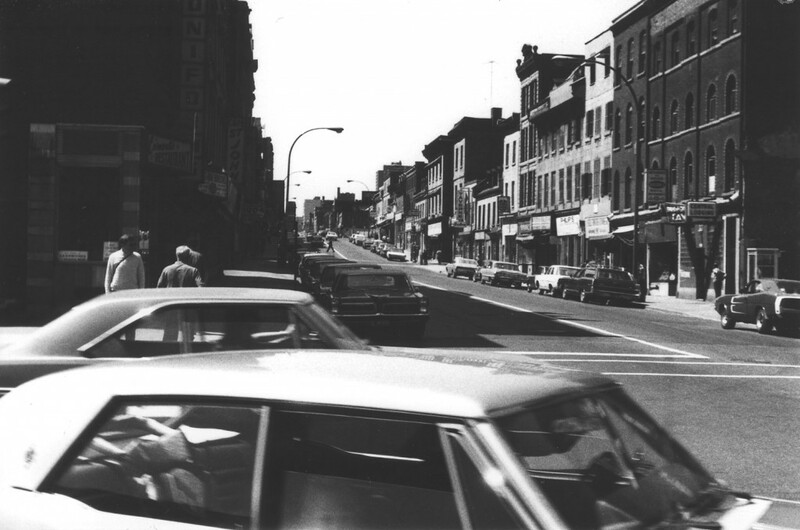 Subordinated both to a rigorous protocol and to the systematic narration of walking, the archives created by these photographs show us that in every act of moving, the individual is in a constant relationship with respect to his or her surroundings. In the late 1960s, Bill Vazan undertook creation of a conceptual, process-based oeuvre that often draws inspiration from his everyday life. He blends photography and text to express the unseen things in life: the passage of time, people’s thoughts – even his own fluctuating body weight. On March 17, 2007, Vazan sat down with us to offer his thoughts about his way of working and talk about some key works that until now have lain dormant; these were first conceived and described in the 1960s and 1970s, but as yet have never been completed or shown. For more than forty years, Bill Vazan has never stopped creating; his art is his life and his life is his art. The following are some excerpts from our meeting with a man whose mind is overflowing with ideas. Q: What first got you interested in conceptual art? A: The answer is complex and perhaps even contradictory as far as my art is concerned. That may have something to do with the fact that I am someone who is by nature neurotic, compulsive and obsessive… At one point I didn’t produce any art objects for ten years – due to a mental trauma in my family, not as the result of any conscious or intellectual decision – and that situation shaped my mind and simultaneously made manifest my relationship to order and repetition. I didn’t have a studio and I didn’t have a lot of time, but I was motivated to formulate ideas that helped me understand the world around me. At that time, certain artists were exploring art based on abstract concepts or thoughts, but the term conceptual art was still unknown. Q: In a project such as Weight Loss, which consists in the recording of your body weight day after day, and in your work in general, you don’t say to yourself, “I’m going to do a conceptual work”? Your projects are born out of ordinary living, out of your everyday existence. Q: In your work, one notices that movement often proceeds in a straight line, and the line is also the basis of many of your projects. Why is the line so important? Q: What does this exhibition represent for you?